Google Maps is fast evolving – It is no more just a destination to find a location or to know driving directions. It has moved far beyond that. Google maps is slowly becoming a comprehensive go to destination for any thing and everything relating to an unknown place, be it local businesses information, Tourist attractions, traffic situation, navigation, 3D street views and much more. And Google is not stopping at that – They are now not only mapping the outdoor world, but also indoors. Recently, they launched street view for popular Indian tourist destinations like Taj Mahal and Agra Fort, where sitting in front of your computer you can see every nook and corner of the monument like Taj! Now, they are extending the same to shopping malls, Convention centers, museums and Super stores in form of “Indoor Maps”. Yes, that’s right, you can now view the interiors of huge shopping mall you were planning to visit next right in comfort of your homes. While it may not be as attractive as some popular tourist spots, it can be of tremendous help when you are planning to visit a mall, which you have never visited before. With Google maps on mobile you can easily navigate and reach where you want to go. 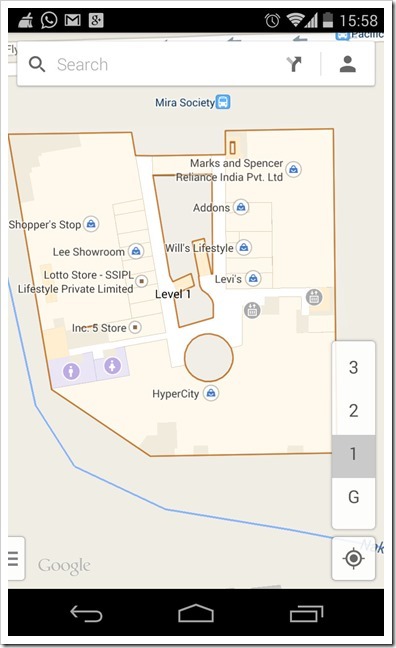 Popular venues like Ambience Mall in Gurgaon, Select City Walk in Delhi or Amanora Park Town in Pune now have their entire floor plans uploaded to Google Maps. In some of the locations, the indoor maps are so accurate that when you move up or down a level, the map on the mobile gets automatically updated to show the map of the floor, you are currently on. I tried checking out Kumar Pacific Mall here in Pune – Here is what Google maps showed me on my mobile. On the right hand bottom corner, you can see various floor plans. The one shown below is of first floor of Kumar Pacific mall. Google has also released a DIY section where Indian business owners interested in getting their location’s floor plan included in Google Maps, they can upload it by visiting maps.google.com/floorplans.